Fans of Michael W. Smith have been given project after project from the talented mega pop star in the past few years beginning with the major success of his 2001 life Worship album. 2003 marked the 20th anniversary of Michael's career and included the release of his second hits compilation spanning the last decade of new music. Now Michael starts off what looks to be another successful year with the release of his second live DVD project, Live In Concert - A 20 Year Celebration. From the makers of Michael's impressive Worship DVD, Live In Concert is another wonderfully constructed project boasting 20 live songs and plenty of features. The project opens with an instrumental version of "Cry For Love" before Michael begins "I Still Have The Dream" followed by his recent hit "Signs." Each song is visually edited well, transitioning different shots and angles of Michael and his band quite smoothly. While some projects take more of the choppy editing approach in hopes of keeping the MTV-bred youth interested, Live In Concert is a more modest effort. The project is a real treat for longtime fans of Smith's work as it mixes favorites spanning his entire career. Highlights include "Secret Ambition," a powerful story of Christ's sacrifice that is fun to watch live as a longer-haired Smith (looking surprisingly similar to his 1988 self), delivers an enthusiastic and energetic performance. Listeners are given a trip back down early 90's pop culture's memory lane as Smith's bangs out the keys to his hit "Place In This World" on his speckled and pyschedelic painted piano. And of course, it shouldn't be a surprise to watch the audience give Smith a standing ovation following the resonating sound of the first couple notes to the everlasting "Friends." As if Smith debuting the first song her ever wrote when he was five years old wasn't enough, fans are treated to a special performance from Amy Grant who walks out on stage to sing along to Michael & Co.'s accompaniment for "Lead Me On," "El Shaddai," and "Thy Word." While it may seem a little odd for her to take the spotlight for a couple songs during a tribute to Smith's work, the two have always been so closely linked artistically that it wouldn't seem right for her not to be involved in such a project. Following Grant's appearance, Smith takes the opportunity to segue into a worship set, including "Above All," "Agnus Dei," "Awesome God" and "You Are Holy." Seeming appropriate, Smitty closes his performance with the anthemic "This Is Your Time." Smith proves with yet another memorable DVD project that he's still got the momentum to keep impacting his world with relevant themes via his signature pop sound. 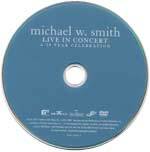 Live In Concert - A 20 Year Celebration is a celebration of Smith's career, and an impressive one at that. For those unfamiliar with Smith's music, Live In Concert is an appropriate look into this man's artistic history. And despite the absence of some key hit songs that I'm sure a lot of fans will miss, this is not a project for diehard Smitty followers to pass up.